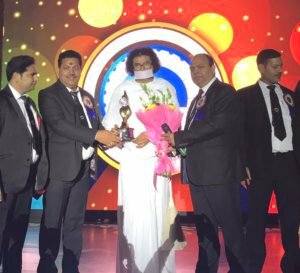 Acharya Dr. Lokesh Muni was honored with the Moral Bharti Award 2018 at the ‘Bharat Nirman Mahasammelan,’ which was hosted by the Moral Institute and held at Tolkotara Stadium in New Delhi, India. Acharya Lokesh Muni has been continuously making efforts for development of human values and establishing non-violence, peace and mutual co-operation in the society for the last 33 years. He has travelled about 20,000 kilometers on foot, throughout the country to remove social evils and propagate moral values. In order to give practical shape to these values he founded ‘Ahimsa Vishwa Bharti’ and thus made his field of activities spread throughout the world. His religious teachings, talk about ‘Purushartha Chaututha’, it says there should be a balance between religion, money, work and salvation and that religion is not against development. “When materialistic development is based on the foundation of spirituality it becomes a boon, otherwise it becomes a curse,” he added.